As with all situations, understand the risk to your thatched property, reduce the risk and increase your peace of mind. If we understand the real causes of thatch fires and therefore the risks, we can work to reducing those risks and improving our thatch fire safety advice. 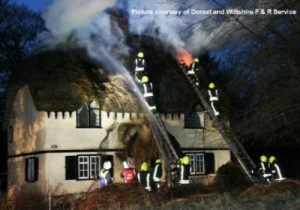 Do thatched property fires occur more than those with conventional roofs or is it just people’s perception? Statistically, homes with thatched roofs are no more likely to catch fire than those with conventional roofs, however if they do the results are often rapid and spectacular. It seems worse, mainly because thatched fires in unprotected properties usually causes severe damage and therefore receives maximum publicity. The risk of thatch fires in old and new properties can be greatly reduced by taking sensible precautions and utilising new specialist products as part of a way forward. Risk reduction is important for peace of mind and when looking at our insurance cover. This guidance is goodwill advice and is not mandatory. It applies to all types of properties with thatch but if alterations to listed buildings are proposed then reference should always be made to the Conservation Officer of the Local Authority for the area where the premises is sited. TAC Fire safety advice – free downloadable leaflet for all thatched property owners – shortly to be updated to include recent research details. 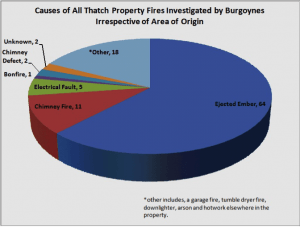 Burgoynes Thatch Fire Survey Update September 2016 (148 fires) . 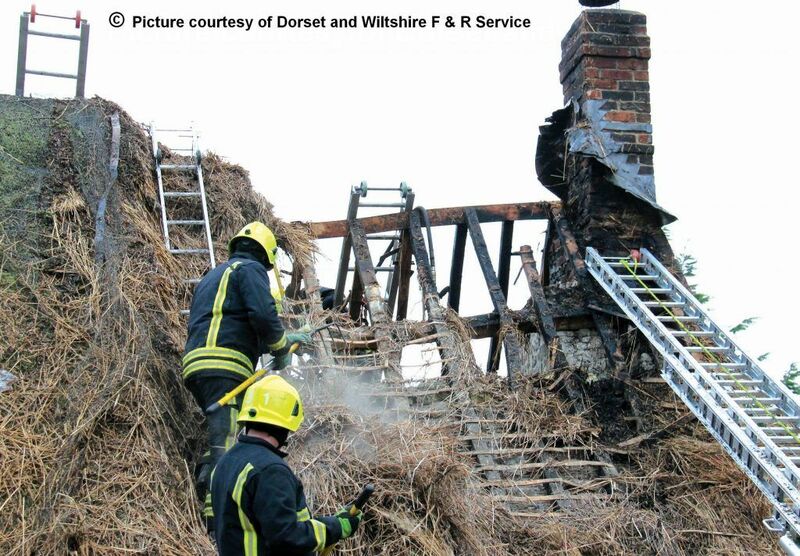 Almost 20 years of establishments promoting the Heat Transfer Theory has led to no real reduction in thatch fires. Probably because the real cause, understood by us and many other specialists and interested parties, was ejected embers. The chimney being blamed was more likely where sparks landed near it or due to damaged pointings/joints. Past research has shown that an ember on thatch will not burst into flames, but burn through to the underneath layers and travel upwards so often is not detected until it is well established. If you’re on this page, please read on as you have an interest in understanding Thatch Fires and reducing them. It is time to look at the facts. Burgoynes’s Keith Benjamin’s excellent Forensic Investigations of 148 thatch fires from December 2008 to May 2016, confirmed ejected embers as being the main cause of thatch fires. This work also concluded that woodburners installation with low chimneys posed a greater risk of causing a fire. Common sense really and now proven forensically using the facts. Heat transfer was not identified as a cause in these 148 fires. The Fire Protection Association research (driven by Historic England and NFU Mutual) has then further confirmed what we knew and helped us better understand the problem of ejected embers and what causes them. Furthermore, heat transfer was again not replicated in all of this research. Sadly, this theory is ingrained in much of the paperwork used by organisations and societies eg Fire Services. Even Building Regulations have been following this line of thought and so change is, unfortunately, bound to be slow. Apart from ejected embers and chimney fires, other risks include chimney defects, electrical faults and bonfires, see below. Thatch burns at just over 200°C, and the FPA did not get bricks to hotter than 80°C with a woodburner running very very very hot. Preserving our heritage and building new thatch more safely is important to us so please, understand this up to date information and how to reduce the risks. Help us by sharing the information and joining us on social media. This work must be promoted to help people make the safest decisions. 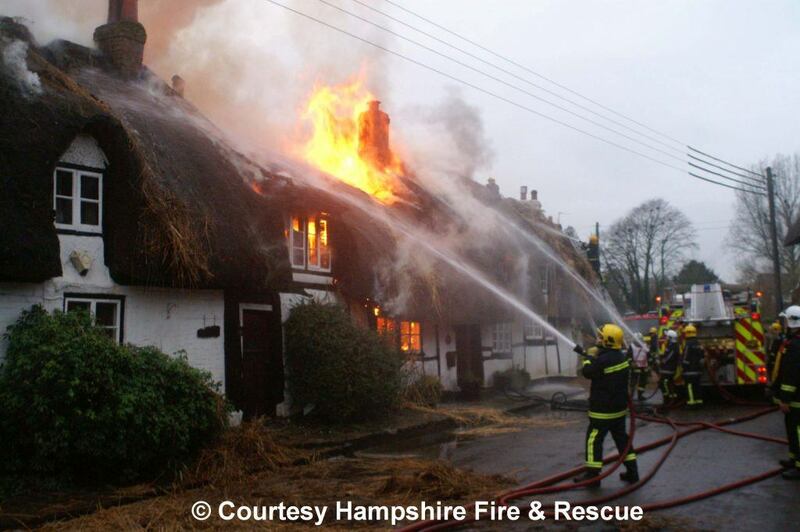 Preventing a thatch fire is our aim and getting these thatch fires down, as we cannot rely on a few wet winters. Based on the main cause being ejected embers, addressing this must the first priority. Chimney fires are to be avoided at all costs and, if you have a woodburner with a lined flu (which meets the building regulations) do not be complacent as this does not address the embers issue. Our advice for chimneys and woodburners. Taking care when lighting fires eg use firelighters (paper and card are not recommended) and when refuelling. Burn your woodburner at manufacturers recommended conditions, look at how you burn in your fire or wood-burner, avoid build up of tars in chimney. Avoid aggressive ventilation. Keep an eye on the chimney/flue temperature. A chimney fire is a big cause of ejected embers. Sweep chimneys regularly, not only at the start but during the burning season and keep woodburner baffles clean too. (a) read our Thatch Fire Safety Leaflet. (b) go to our Reducing the Risk page for more information on specialist products and other detailed relevant advice. Please remember many thatch properties successfully use fires/stoves as heating, and always advise your insurers with any changes to your chimney or installations. Thanks to the Fire Services (Hampshire Fire and Rescue, Dorset and Wiltshire Fire and Rescue and Suffolks Fire and Rescue ) for use of their helpful pictures on these pages – all contributions gratefully received.